Instructions for UW-Green Bay instructors for submitting Scantron Exams for processing at IT Client Services. The Division of Information Technology offers a test scoring and analysis service to the instructors at the University of Wisconsin-Green Bay. If an instructor designs a multiple choice answer test, a scanner sheet can be used for the students' responses and then can be read and scored. The results include: an exam summary, test scores, class roster, an item analysis of the questions, and the absolute frequency of scores on the exam. E-mailing students their grades is also an option for instructors. There is no charge for any of the scoring services currently being offered. However, each unit is responsible for obtaining the Scantron answer sheets, available through "Stores" through their area's support person. 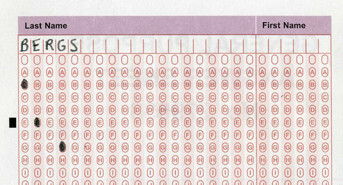 Completed Exam Sheets are processed by an Scantron OpScan 8 Optical Scanning unit. 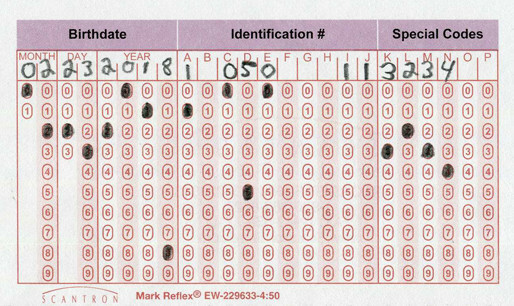 Only Scantron original scanner sheets can be used. Photocopies will not scan properly, and pencils are strongly encouraged on Exam Sheets. Blue or black ink will be read by the scanner, but cannot be erased if a mistake is made. A "key" answer sheet must be provided by the instructor when submitting an exam to be graded. True/False questions are handled by using response patterns A and B respectively. There are several options that will enhance your usage of the test-grader. Please take the time to examine the options before submitting your test. Please call or e-mail Scott Berg with any questions regarding exam scanning services. Students should be directed to fill in their last name, and first name, in the appropriate fields. Next, instruct students to blacken the corresponding bubble below each letter in their name. Students will need to fill in the last nine digits of their Student ID Number in the "IDENTIFICATION #" field (use columns A-I, leaving J blank). Again the bubbles corresponding to those numbers must be darkened. The answer sheet allows for 5 possible responses, but can accept only one response per question. The grading program compares the student's responses to the instructor's key sheet answers. The Identification Fields need to be completed with information that is specific for each individual test. It must include a "1" in column A, the number of questions on the exam, the email preference, and the SIS class number. It can also optionally include the date the exam was given. See the example below, which includes explanations of each of the fields to be filled in. The columns in the Birthdate section can optionally be used for the date of the test. The example above shows February 23, 2018 filled in. Column A is required and must contain a 1. This designates to the processing system that the sheet is an exam key. Fill in columns C, D, & E with the number of test questions. The number must be 3-digits in length, so use leading zeroes, when necessary (example: 050 for 50 questions, or 006 for 6 questions). The bubbles below the numbers need to be darkened. This number is divided into the student scores to calculate the percentage scores. This number has no effect on which questions are graded; the processing system will grade every question that has an answer filled in on the answer key. Columns I and J are for E-mail Requests. Marking a 1 in column 'I' will send emails to students showing their test results and a 1 in column 'J' will send an email to the instructor showing the test results for all students. You may select one option or both. The email preferences are human-read, so bubbles do not need to be filled in for the email preference indicators ONLY. Your Class Number should be entered in Columns K thru O. Fill in these columns with the 4 or 5-digit Class Number from SIS. Do not pad this section with any zeros. You need only provide one class number for a cross-listed course. Instructors should deposit tests to be scored in the "Drop Box" located outside of IS 1010. Exams are processed Monday through Friday between 8:00 am and 4:30 pm. Most exams will be processed the same day they are received; however, instructors should allow for up to two business days processing time. Once processed, instructors should pick up their exam packet(s) from the IT Help Desk at their earliest convenience. Double answers: the darkest response of a double answer will be read, or a read error will occur and neither answer will be accepted. Student Name and ID coded correctly on each answer sheet. Poor erasure marks, pieces of eraser, folded sheets, post-its, and paper clips/staples can all cause slower or inaccurate processing of exams and may damage equipment or ruin forms. General orderliness of response sheets -- response sheets should all be the same side up with the identification number section at the top. Only Scantron specific scoring sheets (available through your department support person) can be used. The instructor answer key must be filled out as described in this documentation. Your "CLASS" number (found on SIS) is required in the Special Codes field on the Instructor Key. This changes each semester. Number of questions is coded in columns C, D, and E of the Identification Field. If you code 25 questions, then decide to throw out #19, code "024" in C,D, & E. Questions with "blank" bubbles on the answer key will not be graded or included in the stats. The number of actual questions filled in with answers should match the question count as designated by columns C, D, and E.
Please notify Scott Berg by e-mail each semester with your authorization list (individuals who can pick up/drop off exams on your behalf). Exams must be hand delivered and picked up from IS 1010 in a timely manner after processing. Policy prevents ATS from sending them via intercampus mail or disposing of any forms. 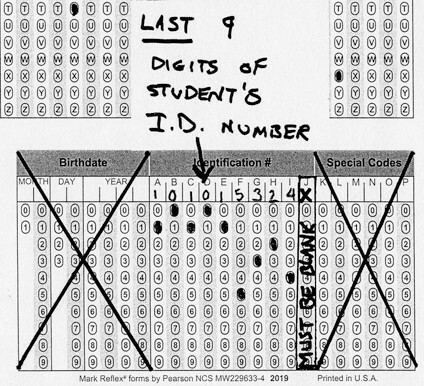 Students MUST ALWAYS include the last nine digits of their student ID number in columns "A - I" and should leave column "J" blank. (Every exam sheet MUST have this 9-digit number regardless of what options you choose). Students who omit their ID number or enter it incorrectly will not receive results emails and their scores will not be transposed to the Class Roster sheet in the instructor's results workbook. Students are strongly encouraged to use pencil. Changes to their answer sheet cannot be made using ink. Only one answer per question is allowed. Questions with multiple answers won't scan as intended. Dark eraser marks can still be read by the scanner. Please use pencil and erase thoroughly if a mistake is made. It is best practice to not reuse answer key sheets from semester to semester. If you have any questions about this service, please contact Scott Berg at (920)-465-2305 or bergs@uwgb.edu.